Home / Desperate Housewives • Fanboying! / Desperate Housewives Star Dana Delany and The Pacifier’s Vin Diesel Stop To Sign Autographs and Meet Fans! Awesome! Desperate Housewives Star Dana Delany and The Pacifier’s Vin Diesel Stop To Sign Autographs and Meet Fans! Awesome! I love featuring articles that feature any of the Desperate Housewives being awesome to fans. Being one of my favorite shows, I have a soft spot for the seven well wait… eight main housewives! That being said, I had to take a break tonight, so I decided to skip out on Ms. Dana Delany. I know, I know… Katherine Mayfair herself! Don’t worry… I’m working on the most killer Desperate Housewives article/experience you will EVER see… Well, read. Lol… Dana Delany is promoting her new show Body of Proof! Anyway, CB called and was like, “Please… PLEASE… Let me write up Vin Diesel!” I don’t get it myself… but hey, an uber fan is a fan right! LOL, God bless him! I know it has to do with cars, Fast and Furious and other craziness… So, I will leave Mr. CB to it. NANANANANA CB, CB, CB! Today I am going for the super fan friendly, super extraordinary, Vin Diesel from The Pacifier. I know, why are you going for Vin Diesel again, well, I’ve got so much stuff for Vin Diesel it parallels Mike’s Buffy the Vampire collection. I told him on Friday I was bringing some cool things for him at his next taping. So I knew, KNEW he was going to sign. Anyways, I knew he was taping a talk show, and I was going to go for him anyways. Katie Holmes was taping too, but I don’t expect her to sign. I brought my Batman Begins DVD cover, because, well, I have too. Dana Delany is here too. Mike loves, LOVES her from Desperate Housewives, but I love her from, you guessed it, THE BATMAN CARTOON! Armed with all my super awesome stuff, lets go. When Vin Diesel jumps into water, he doesn’t get wet, the water gets VIN! If you rearrange the letters of Vin Diesel you get his credo, “I END LIVES”. Vin Diesel Irons his shirts while wearing them. There is no “I” in team, there are two I’s in Vin Diesel! 5:00: I’m here and there are a lot of paps. I didn’t know Dana Delaney and Vin Diesel were so popular! 5:01: Really, you guys are here for Katie Holmes? Which way to the Scientology Church? 5:40: First arrival, Katie Holmes gets dropped off right at the door. NOTHING! Not even a wave! 5:50: Dana Delany arrives, she at least waves! 6:20: Vin arrives super late, like he always does. He waves and we yell for him and he goes right inside. He’s super late. 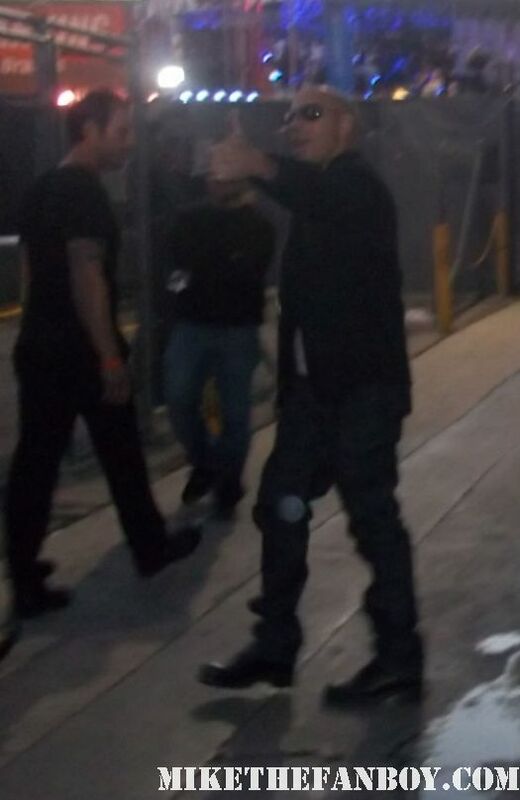 7:10: We see security moving and it’s Vin, we yell for him and he goes right into the gate…or does he? He peeks his head out as if he is playing hide and seek with us and comes right over to me. He actually remembered me and came over right to me and signed all my stuff. Super stand up guy. Since I mainly came for him, I’m happy. 8:15: Security is moving and it’s Katie, we chant and chant for her but she leaves immediately. Not even a wave. Oh well, I really didn’t expect anything from her. 8:20: Dana is leaving now and we chant for her and she comes right over. What a sweetheart. But now, 2/3 of the crowd has left. I think only about 12 of us are left. She signs for everyone. She’s so so nice. I’m stoked I got Vin, and I’m even more stoke he remembered me and came straight to me. YAY CB! Until next time, same CB hour, same CB channel, same CB BLOG. KAPPPOOOOW! Franky Went To Hollywood Remembers Meeting Whitney Houston and Bobby Brown! Autographs and More! The Hangover Part III Movie Premiere Photos! Bradley Cooper! Ed Helms! Zach Galifianakis! Justin Bartha! Heather Graham! Jamie Chung! And More! Throwback Thursday! 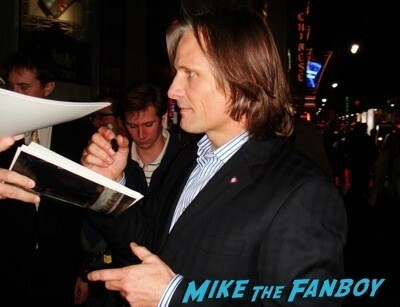 Meeting Viggo Mortensen And Being Shocked That Charlize Theron Isn’t Nice! Say Wha? The Game Of Thrones World Premiere Debacle! Or When A Studio Says Doing Press Is More Important Than The Fans! Ouch!